Pneumonia And MRSA: Who's At Risk Due To A Flu Complication? Every year, we experience a flu outbreak. One of the most common post-flu complications is pneumonia caused by Staphylococcus aureus. In the past few decades, a new type of multi-drug resistant S. aureus, called MRSA, has emerged. The flu is a respiratory infectious disease caused by the influenza virus. It affects humans as well as other mammals and birds. There are four types of the influenza virus (three of which are infectious to humans) with many serotypes within each group. Their infectious potential varies; while it usually affects only a part of the population which is at risk because of their immune status, because they're unvaccinated, or both, there have been several pandemic outbreaks of the flu throughout history, the most extreme example being the Spanish flu outbreak in 1918. resulting a death toll of up to 100 million people. While most of the infected recover on their own, some parts of the population are more susceptible to the disease, and have a higher chance of complications, including newborns and children under the age of five, the elderly, people with certain chronic illnesses, people with weakened immune systems, people who are very obese, pregnant women and women up to two weeks postpartum, and residents of nursing homes and other long-term care facilities. As a result of flu complications, there are over 200 000 hospitalizations in the US each year. One of the well-recognized complications of influenza is pneumonia caused by Staphylococcus aureus. MRSA (methicillin-resistant Staphylococcus aureus) is a strain of Staphylococcus aureus resistant to penicillin and standard penicillin-related antibiotics. While infections caused by MRSA in no way differ from ordinary staph infections, years of use and the abuse of antibiotics have caused some strains of Staphylococcus aureus to evolve and become resistant to most of the antibiotics commonly used to treat staph infections. Studies show that about one third of the population carries S. aureus in their nose, and about two in 100 carry MRSA. These individuals do not necessarily develop an infection, but can easily spread the germs to the population at risk. MRSA infections are most commonly found in people who have been hospitalized or spent time in other health institutions, such as nursing homes or dialysis centers. These infections are known as health care-associated MRSA (HA-MRSA). The other type of MRSA infection appears in the wider community, among healthy people. This type of infection is known as community-associated MRSA (CA-MRSA). While the population at risk of contracting CA-MRSA includes people engaging in contact sports and people living in crowded areas, HA-MRSA infections are usually contracted after invasive procedures in medical institutions. The influenza virus and MRSA form a deadly combination, with a mortality rate of up to 50 percent even when using proper medication. The reason for this is found in our own immune system. White blood cells release molecules aiming to kill the pathogen. But, in patients who contracted influenza, this process is altered, and the molecules end up targeting lung cells, causing inflammation and damage to the tissue. The altered tissue is where MRSA enters the organism, causing necrotizing pneumonia. Who's at risk of flu-related MRSA? 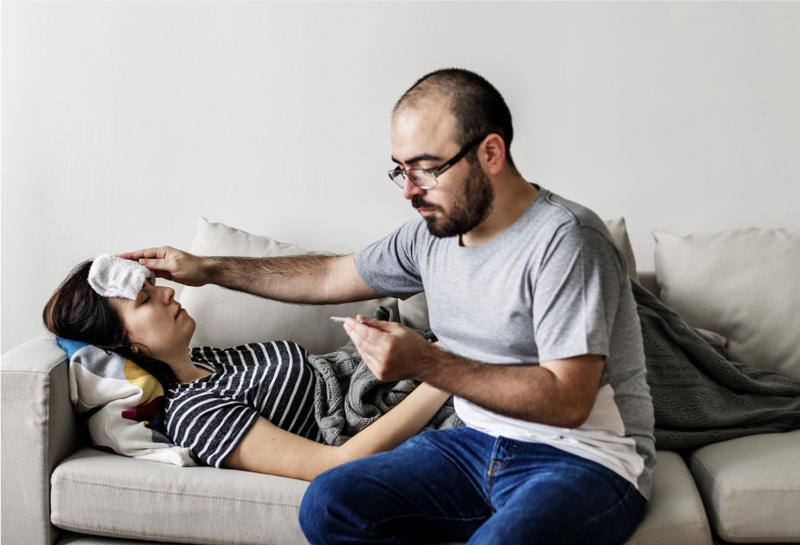 What a significant number of patients suffering from post-influenza MRSA pneumonia had in common were recent soft tissue MRSA infections or living with somebody with a history of such infection. If an infection is contracted, the doctor may prescribe antiviral drugs. These are not the same as antibiotics, since antibiotics do not work against viruses. Antivirals are prescription medicines and are not available over-the-counter. These drugs can make the symptoms milder, and the disease shorter, and for people with high-risk factors, can mean the difference between a mild infection and hospitalization. In cases where MRSA pneumonia has been contracted, antibiotics must be used. Vancomycin has been considered the treatment of choice for MRSA pneumonia for a long time, but with progressive increase of VISA (vancomycin intermediate Staphylococcus aureus) infections, its limited distribution in the lung tissue in consideration of the severe adverse effects of this antibiotic, a new drug (i.e. linezolid) is being used more often. Recent studies showed that, not only does linezolid have better pharmacokinetic and safety attributes, but it also has immunomodulatory effects on the host’s inflammatory response, thus preventing lung tissue injury. The flu is a very contagious and, potentially, a fatal disease. The best way to stop it is to prevent it. If a person is in a high-risk group, vaccination should be considered. Avoid going to crowded places during flu season, or wear a medical face mask. In case of prolonged flu-like symptoms, always see your doctor. MRSA is a common bacteria that evolved to be a superbug in just a few decades through the incorrect and irresponsible use of antibiotics. Antibiotics should only be taken when prescribed, and in the way the doctor prescribed them. Though the combination of these pathogens is very contagious and could be highly dangerous, it can be prevented with proper treatment. When Do Antibiotics Start Working? Comments and reviews on article "MRSA - Methicillin Resistant Staphylococcus Aureus Fact sheet"